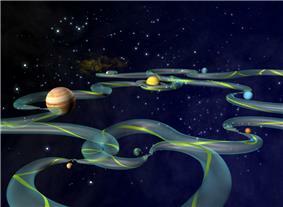 This stylized depiction of the ITN is designed to show its (often convoluted) path through the Solar System. The green ribbon represents one path from among the many that are mathematically possible along the surface of the darker green bounding tube. Locations where the ribbon changes direction abruptly represent trajectory changes at Lagrange points, while constricted areas represent locations where objects linger in temporary orbit around a point before continuing on. The Interplanetary Transport Network (ITN) is a collection of gravitationally determined pathways through the Solar System that require very little energy for an object to follow. The ITN makes particular use of Lagrange points as locations where trajectories through space are redirected using little or no energy. These points have the peculiar property of allowing objects to orbit around them, despite lacking an object to orbit. While they use little energy, the transport can take a very long time. As it turns out, it is very easy to transit from a path leading to the point to one leading back out. This makes sense, since the orbit is unstable, which implies one will eventually end up on one of the outbound paths after spending no energy at all. However, with careful calculation, one can pick which outbound path one wants. This turned out to be useful, as many of these paths lead to some interesting points in space, such as the Earth's Moon or the Galilean moons of Jupiter. As a result, for the cost of reaching the Earth–Sun L2 point, which is rather low energy value, one can travel to a huge number of very interesting points for a little or no additional fuel cost. The transfers are so low-energy that they make travel to almost any point in the Solar System possible. On the downside, these transfers are very slow, and only useful for automated probes. Nevertheless, they have already been used to transfer spacecraft to the Earth–Sun L1 point, a useful point for studying the Sun that was employed in a number of recent missions, including the Genesis mission, the first to return solar wind samples to Earth. The Solar and Heliospheric Observatory began operations at L1 in 1996. The network is also relevant to understanding Solar System dynamics; Comet Shoemaker–Levy 9 followed such a trajectory on its collision path with Jupiter. In a more recent example, the Chinese spacecraft Chang'e 2 used the ITN to travel from lunar orbit to the Earth-Sun L2 point, then on to fly by the asteroid 4179 Toutatis. In addition to orbits around Lagrange points, the rich dynamics that arise from the gravitational pull of more than one mass yield interesting trajectories, also known as low energy transfers. For example, the gravity environment of the Sun–Earth–Moon system allows spacecraft to travel great distances on very little fuel, albeit on an often circuitous route. Launched in 1978, the ISEE-3 spacecraft was sent on a mission to orbit around one of the Lagrange points. The spacecraft was able to maneuver around the Earth's neighborhood using little fuel by taking advantage of the unique gravity environment. After the primary mission was completed, ISEE-3 went on to accomplish other goals, including a flight through the geomagnetic tail and a comet flyby. The mission was subsequently renamed the International Cometary Explorer (ICE). The first low energy transfer using what would later be called the ITN was the rescue of Japan's Hiten lunar mission in 1991. Another example of the use of the ITN was NASA's 2001–2003 Genesis mission, which orbited the Sun–Earth L1 point for over two years collecting material, before being redirected to the L2 Lagrange point, and finally redirected from there back to Earth. The 2003–2006 SMART-1 of the European Space Agency used another low energy transfer from the ITN. The ITN is based around a series of orbital paths predicted by chaos theory and the restricted three-body problem leading to and from the unstable orbits around the Lagrange points – points in space where the gravity between various bodies balances with the centrifugal force of an object there. For any two bodies in which one body orbits around the other, such as a star/planet or planet/moon system, there are three such points, denoted L1 through L3. For instance, the Earth–Moon L1 point lies on a line between the two, where gravitational forces between them exactly balance with the centrifugal force of an object placed in orbit there. For two bodies whose ratio of masses exceeds 24.96, there are two additional stable points denoted as L4 and L5. These five points have particularly low delta-v requirements, and appear to be the lowest-energy transfers possible, even lower than the common Hohmann transfer orbit that has dominated orbital navigation in the past. Although the forces balance at these points, the first three points (the ones on the line between a certain large mass, e.g. a star, and a smaller, orbiting mass, e.g. a planet) are not stable equilibrium points. If a spacecraft placed at the Earth–Moon L1 point is given even a slight nudge towards the Moon, for instance, the Moon's gravity will now be greater and the spacecraft will be pulled away from the L1 point. The entire system is in motion, so the spacecraft will not actually hit the Moon, but will travel in a winding path, off into space. There is, however, a semi-stable orbit around each of these points, called a halo orbit. The orbits for two of the points, L4 and L5, are stable, but the halo orbits for L1 through L3 are stable only on the order of months. ^ Ross, S. D. (2006). "The Interplanetary Transport Network" (PDF). ^ Marsden, J. E.; Ross, S. D. (2006). "New methods in celestial mechanics and mission design". Bull. Amer. Math. Soc. 43: 43–73. ^ a b Conley, C. C. (1968). "Low energy transit orbits in the restricted three-body problem". SIAM Journal on Applied Mathematics 16: 732–746. ^ Lo, Martin W. and Ross, Shane D. 2001. The Lunar L1 Gateway: Portal to the Stars and Beyond, AIAA Space 2001 Conference, Albequerque, New Mexico. ^ Ross, S.D., W.S. Koon, M.W. Lo and J.E. Marsden. 2003. Design of a Multi-Moon Orbiter. 13th AAS/AIAA Space Flight Mechanics Meeting, Ponce, Puerto Rico. Paper No. AAS 03–143. ^ Lo, M. W., et al. 2001. Genesis Mission Design, The Journal of the Astronautical Sciences 49:169–184. ^ Ross, S. D. 2003. Statistical theory of interior–exterior transition and collision probabilities for minor bodies in the solar system, Libration Point Orbits and Applications (Eds. G Gomez, M.W. Lo and J.J. Masdemont), World Scientific, pp. 637–652. ^ Farquhar, R. W.; Muhonen, D. P.; Newman, C.; Heuberger, H. (1980). "Trajectories and Orbital Maneuvers for the First Libration-Point Satellite". Journal of Guidance and Control 3: 549–554. ^ Belbruno, E. (2004). Capture Dynamics and Chaotic Motions in Celestial Mechanics: With the Construction of Low Energy Transfers. Princeton University Press.